S-Yard and ENA – Discover the Made in Japan Difference! Most golfers in North America are not aware there are huge differences in the quality and specifications of clubs sold here versus those in Asian markets like Japan. 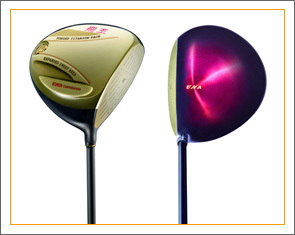 Even the popular North American brands, in general, sell vastly different versions of their clubs overseas which usually use Japanese made components. The quality and tolerances of the specs of these clubs made in Japan are much higher than the more mass produced models sold in North America sourced from other areas of Asia. The weight of shafts made in Japan can be as light as 40 grams for the driver (ENA has shafts under 40 grams in weight). Compare this to steel shafts which can often weigh over 120 grams and graphite shafts made in other areas of Asia commonly in the 60 gram range. These ultra-light shafts will help golfers with a slower swing gain back higher club head speed which results in greater distance. While these ultra-light clubs will not suit players with high swing speeds, many players will find these clubs easier to swing. Fitting of these shafts are key to find which model will give the greatest benefit for the individual golfer. Stop by and try selected demo clubs.